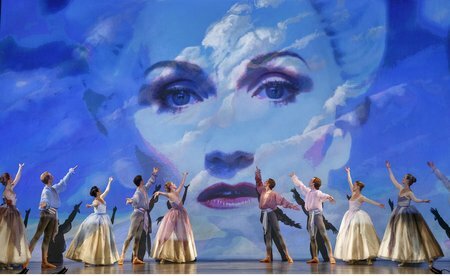 From the moment I walked into the theatre and saw the large scale backdrop depicting rolling, sinuous sand dunes, I knew that Opera Atelier’s production of Alcina by G. F. Handel was going to be a bit of a departure from their usual style. Usually, Opera Atelier productions make use of a consistent recipe that is working for them. It consists of fairly diligent adherence to period conventions. This production had all those elements: form fitting satin pants, lavish capes, men in high heeled boots, ballet dancing between scenes, stylized tableaus with formal gestures and poses. The production also used video projection. Set designer Gerard Gauci justifies this choice in a period production because experiments with magic lanterns and mirrors were already being used for visual effects in theatre during Handel’s lifetime. According to him, video projection is the evolution of that technique. The use of projection was effective at evoking the magical realm that the evil sorceress Alcina (Meghan Lindsay) has conjured using the souls of her discarded lovers. The brave knight Ruggiero (Allyson McHardy), and his betrothed, Bradamante (Wallis Giunta) find a way to break Alcina’s enchantment using the power of true love. The projection appeared to be cast and ballet company members live backstage. Living, breathing, larger than life bodies or body parts were superimposed over more conventional painted scenes. The effect was visually arresting and memorable. While I greatly appreciated the technique as a whole, there were a couple of occasions on which my companion and I found the images somewhat jarring in the context of the overall feel of the production; most notably repeated bright red lips à la Rocky Horror Picture Show. As usual for Opera Atelier, the costumes, sets, and choreography were spectacular. The colour scheme for this show was a harmonious blend of ethereal pastels and earthy neutral tones. The decadent crushed velvet, satin and tulle are some of the best features of a good period production, in my opinion. All of the principal singers had some Opera Atelier experience and in some cases the performer had done numerous roles with the company. As a result, the use of period gestures looked fairly comfortable and worked well as a medium for creative expression for the cast. Meghan Lindsay is not the most obvious choice for a villain. While her sound is very robust, it is also quite sweet and her features are very delicate. Ms. Lindsay managed to inject enough bite into her timbre and enough menace to her demeanor that she was convincing in the role of the evil sorcerer. Allyson McHardy has a dark mezzo-soprano instrument with a warm vibrato that is just great for a pants role. Her stage presence was also very dashing. Mezzo-Soprano Wallis Giunta was lovely in the role of Ruggiero’s faithful intended. My companion was especially blown away by her considerable vocal agility and bell-like clarity. This was a very memorable Opera Atelier production. Although the company may still need to work out some of the nitty-gritty of how to use this projection technique in a manner that is in keeping with the rest of their style, I believe the technique has a lot of potential, and I hope they use it again in future. A definite change of pace from their usual approach, and a great opportunity to see a period production with a twist.